At least nine people are reported dead as a result of torrential flooding in the Georgian capital Tbilisi on Sunday. Heavy rain caused a river in the city to burst its banks, sweeping away buildings and cars and causing devastation amounting to millions of euros. A city official said dozens of families remain homeless as their houses were destroyed or damaged by the floods. Another danger is that the floodwaters damaged cages at the zoo, setting many animals free. The authorities are now on the hunt for bears, lions, tigers and wolves. Residents were advised to stay indoors until they are recaptured or killed. 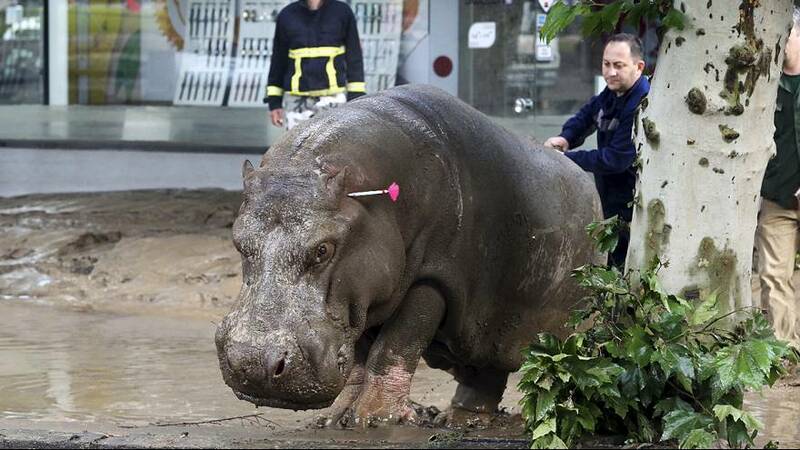 Some have already been caught like a hippopotamus found wandering around near one of the city’s main plazas. The beast had to be shot with a tranquilser dart before being led away. Helicopters were circling the city as part of a search and rescue operation and the city’s mayor said the situation remained very grave.